Futaba develops and manufactures small PMOLED displays for consumer applications including flexible PMOLEDs. Last month Huawei unveiled their TalkBand B1 smart wearable device. It was reported that the display is a 1.4" white flexible (curved) OLED. It wasn't clear who the maker of this display was, and whether it is actually flexible. Now Huawei posted the full specification of the TalkBand, and it turns out that the display is indeed a curved OLED. It is a 1.4" 128x16 PMOLED panel made by Futaba. This is Futaba's film OLED, and it's probably the first device to use those curved (flexible) panels. Towards the end of 2013, Futaba indeed said they finished development of those panels. In any case, Huawei reveals that the panel is only 0.3 mm thick and it weighs only 1 gram. Futaba is a small OLED producer, mainly making PMOLED panels (including transparent ones) and developing new OLED technologies. Back in October 2011 Futaba bought out TDK's part in their joint OLED company, which is now a subsidiary of Futaba. The company was kind enough to send us their OLED roadmap for the next few years (you can compare it to Futaba's previous roadmap released in 2012). 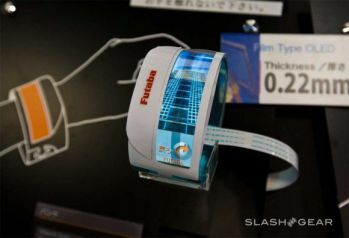 Futaba developed curved formable (flexible) PMOLEDs which they call film OLEDs. These are formable panels that can be placed on curved surfaces - but they cannot be flexed or bent by the device user. The company showed a 3.5" (256x64) full-color flexible PMOLED prototype at CEATEC 2012. 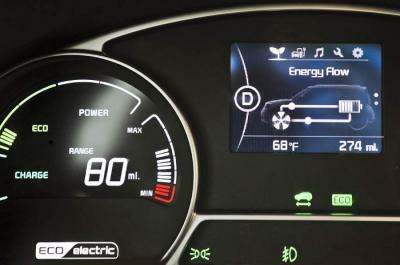 Some of the panels displayed since were touch (capacitive) ones. One of the technology used in film OLEDs is the company's solvent-free liquid desiccant, the OLEDry-S.
Back in December 2012, rumors started to circulate about an upcoming Apple smartwatch called the iWatch. At first it was reported that Apple will use a 1.5" touch PMOLED made by RitDisplay. Later on in 2013 it was reported that Apple will use 1.5" PMOLEDs produced by Foxconn. Today Korea's Chosun Ilbo claims that Apple decided to use a plastic flexible OLED panel. According to the reports, Apple is developing three models, with 1.3", 1.4" and 1.5" displays. They already produced a prototype 1.5" device. Chosun is quoting "industry sources" in their short article. The first item they show is the Lenovo S-800 that uses Futaba's 40% transmissive 2.4" QVGA (240x320) PMOLED panel. The S-800 was unveiled towards the end of 2010, and sadly it seems that it's the only device to use Futaba's transparent OLEDs. 4D Systems (an Australian R&D company that supplies OLED displays) recently started to ship their first transparent OLED display, the uTOLED-20. Here's my hands-on review of this great little OLED panel. Futaba unveiled a new 3.5" (256x64) full-color flexible PMOLED prototype. The new prototype is thin (0.22 mm thick - thinner than Futaba's current 0.29 mm thin panels) and features 100 cd/m2 brightness. This seems to be quite similar to the old flexible OLED panel shown at CEATEC 2010 by TDK Micro (now owned by Futaba), but it's quite a bit thinner (back in 2010 the panel was 3 mm thick). The old panel was made on a resin substrate and used a white emitter with color filters. We do not know the technology used in the new panel.